I am flattering myself a little bit here, because my apology assumes that I have something remotely resembling a “fan base” (I may, but were I a betting man I would happily wager that it does not extend far beyond close friends and relatives). Anyway, this past week has been tough on me, time-wise. I was away from home and from all electronic devices this past weekend, and I’ve had to cook every night this week…plus laundry one night. I have not had as much time for blogging as I would like. 1. A reflection on my weekend retreat at a Cistercian Monastery. I’ll try to have something up tomorrow — but I did just find out tonight that I will need to go shopping, so I make no promises. First of all, my apologies to anyone who may have gotten a notification that I had published a post a couple of days ago. I was testing to something out, and had meant to save my “blank post” as a draft rather than publish it. Needless to say, it didn’t work. Mea culpa. Interestingly, this way of experiencing life bears a small resemblance to animal consciousness. This, in fact, is part of what differentiates humankind from the animal kingdom. Animals have senses and instincts, and these facilitate all kinds of sensory/instinctual “experiences.” But an animal does not have an “I” to tie it all together; in other words, it doesn’t have personhood…an immortal soul. To experience one’s life as a mere progression of milestones or experiences is as close as a human being can get to living the life of an animal. So we can see why it causes Olivia (Patricia Arquette) — and, by way of heredity, Mason, Jr. (Ellar Coltrane) such angst. It is as if an animal — say, a kangaroo — were somehow forced to remain stationary, like a rock, tree, or other non-sentient creature; this would prevent it from doing what it is meant to do, and would therefore kill it. So what is this “more” that we, as human beings, are wired for? Of course, this verse refers primarily to the marital aspect of man’s existence, and to how a man and a woman complete one another. But since man is made for fellowship, he also seeks and desires friendship, partnership, filial bonds, etc. But even these human bonds (wonderful and necessary as they are) are not enough. We will probably never know whether elves or fairies ever existed (not on this side of life, anyway), but I think the fact that people of almost all times and places have believed in some variation of them speaks to us of each person’s desire for fellowship — or at least coexistence — not only between him/herself and other persons, but between the human race and other kinds of persons. We do, by way of both revelation and reason, know that God created the angels — non-corporeal spirits who share with humankind the status of personhood, of the “I” — to watch over and guide us. Seeking fellowship with them would seem sensible. After all, if neither anything in this world nor even human companionship can ultimately satisfy us, wouldn’t it behoove us to look to creatures that are greater than ourselves? But would even this be enough? Marvelous and splendid as he might be, an angel is a creature, and therefore limited. To limit oneself to a close friendship with one angel is to do so to the exclusion of countless others, each singular and unique. And lest we think we can solve that conundrum by putting stock in a generalized relationship with all of the angels — even one that involves varying degrees and kinds of relationship, as exist among human beings — a closer look would reveal that this, too, gives us only a higher and more beautiful series of phenomena that, like the events of Olivia’s life, are unrooted in someone or something solid. What we yearn for is nothing less than infinite beauty, unlimited goodness, eternal truth…God Himself. I really thought I’d be able to make it in four posts, but it looks like I’ll have to add one more. The next and final post will flesh out this last point in relation to the movie. When our protagonist, Mason Evans Jr. (Ellar Coltrane) is about nine or 10 years old, he and his sister spend a fun-filled weekend with their dad, Mason Sr (Ethan Hawke). Late at night in the latter’s apartment, Mason Jr. asks, with a wistful note in his voice, if it is true that there are no magical beings — like elves — in the world. At first, dad ducks the question with a question of his own — namely, why elves should be considered more wondrous than, for instance, whales. He asks Mason Jr. what he would say if he told him there was a sea creature so big that you could literally walk through its arteries. Here’s where dad has to be straight-up. Mason Jr. is at the age where children typically stop believing in Santa Claus, the tooth fairy, etc. In other words, this is when the natural wonder of childhood begins to fade, making way for the jaded “realism” of adulthood. But it was not always that way. While throughout human history there was always a distinction between childhood and adulthood based on growth, experience, etc., there was not in ancient or medieval societies the very sharp differentiation we see today. Mankind’s natural openness to wonder did change from childhood to adulthood, but it was always maintained and amplified in one way or another, and found expression through various cultures, traditions, lore, religions, etc. notes a sudden realization that her life has been a mere series of benchmarks (…) …a series of incidents, with nothing to connect them all. What we are lacking, as a culture, is a comprehensive worldview, or horizon of meaning — a meta-narrative, as it were. Whereas the Christian meta-narrative is what has defined Western culture for most of the past 2,000 years, the last several centuries have seen it become progressively more dominated by the meta-narratives of scientism and, derivatively, materialism. According to the broadly defined mode of thought to which both meta-narratives belong, history is mankind’s long struggle against the “primitive,” “childish” darkness of religion (which proponents of this general worldview equate in all instances with superstition), culminating in its final emergence and self-assertion through science, technology, quantifiable knowledge, the conquest of nature, and even just general human ingenuity. Please bear in mind that I am not trying to belittle science, technology, personal ambition (rightly ordered), or the achievements of modern man. Far from it. But the problem is when these come to define our world and our values. When this happens, we close ourselves off to any notion of the transcendent and insulate ourselves against a teleological vision of a world charged with meaning and purpose. Proponents of materialism and scientism will typically respond to this objection by pointing to the inexhaustible wonder of the world as present to us, much as Mason Sr. responds to his son’s question by pointing to the wonder of whales. But in our hearts, we find that we must side with Mason Jr. on this one. As wondrous as the world we can see and measure is, it is not enough. 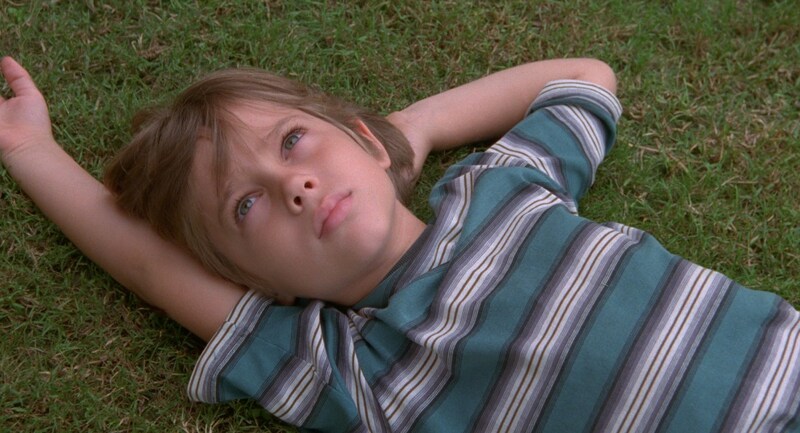 Our exploration of “Boyhood” has led us down an interesting rabbit hole, for sure. We’ll see, in part four, where it finally leads us.